Discover the perfect Texas themed gifts and souvenirs with our wide selection of products. 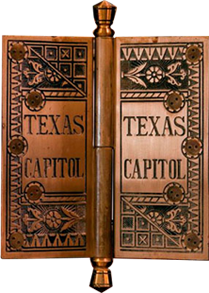 From souvenirs like belt buckles, t-shirts, magnets and mugs to unique gifts like our one of a kind hand made jewelry boxes and sculptures from trees that once graced the Capitol's grounds there's something for everyone. Display your fierce Texas pride with the Gonzales flag's defiant "Come and Take It" motto, or Davy Crockett's famous quote "You may all go to hell, and I will go to Texas" emblazoned on a t-shirt, magnet or mug. Or find something for your four legged friend with our selection of dog leashes, collars and Texas shaped dog bowl.